The contributors are members of prestigious universities and industries from around the world. 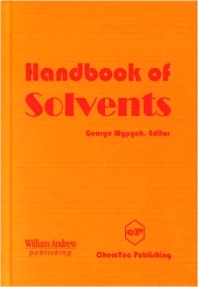 Altogether, they have written 47 books and hundreds of paper on the subject of solvents. Here they give a synthesis of their experiences and opinions on how to best change the global use of solvents in order to both benefit from the technology, and limit health, safety, and environmental risks. Solvent manufacturers and formulators, analytical chemists, environmental engineers, civil engineers, industrial engineers, industrial hygienists, legislators and regulators concerned with the environment, hazardous waste disposal, and workplace safety, medical and biological impact researchers in industry and academia.